When you think of Australian wine you think of the Hunter Valley. This gorgeous region has been built on a history of passion and dedication to the craft, resulting in the production of many exquisite and world-class wines. However, there is more to the Hunter Valley than wine (gasp! ), and with the wide array of activities on offer, the Hunter is the perfect get away. Take a trip to the Hunter Valley for a weekend spent frolicking through vineyards, attempting to cultivate your inner sommelier, and getting adventurous—whether it be hot air ballooning, cycling, or horse riding. 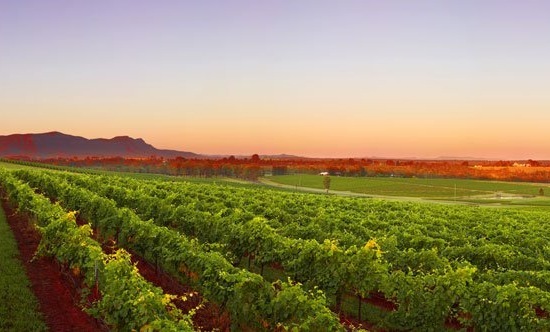 Read on for our stellar guide to things to do in the Hunter Valley. Could there be a better way to start your day than to experience the sprawling, green Hunter Valley vineyards by air? 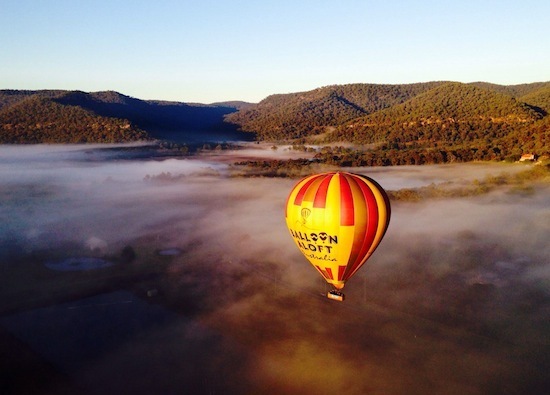 Starting at sunrise, Balloon Aloft will carry you up, up, and away over the picturesque wine region, where you can follow the meandering path of the Hunter River and soar high over the treetops. The peaceful, sky-high adventure ends with a gourmet champagne breakfast at the famous Peterson House winery and restaurant. For those wanting to keep active, you can ride the wine trail on your bike, with Grapemobile, a consecutive winner of the Hunter Valley Tourism Award. With trail rides catered to your desire (from the jolly jaunt to the fit and speedy) you will start your ride from Grapemobile's own vineyard, Pokolbin Brothers Wines, and cycle your way along to a host of boutique wineries and delicious eateries in the Hunter Valley. Over the past two generations, the Scarborough family has poured their love and pride into their vineyard and wine creations. The view is unbeatable and the family's personal, warm welcome ensures that Scarborough Wine Co is on our Hunter Valley itinerary. Enhance your inner wine sommelier while sipping on their renowned, distinctive White and Yellow label Chardonnay, which is perfectly paired with a divine bread and cheese platter. Bread + cheese + wine = winning. Brokenwood was founded over 40 years ago and has developed into one of the Hunter Valley's regional institutions. The vineyard has consistently continued to produce impeccable wines, but for all you red lovers the crème de la crème is definitely the multi award-winning Graveyard Vineyard Shiraz. Who could argue with a wine labeled 'exceptional' on Langton's Classification of Australian Wine? Not us! Adina Vineyard produces a wide variety of Hunter Valley favourites, from Semillon, Shiraz, and Chardonnay and was also one of the very first vineyards in Australia to plant the Italian classics, Pinot Grigio and Sangiovese. Adina also offers first-class accommodation and produces the Hunter Providore gourmet range featuring olive oil straight from their olive grove, home made dukkah, and other tasty delights. Whether it is to drink, taste, or sleep, if you're in need of a one stop wonder to please everyone's tastes, Adina is for you. Enzo is a charming café in the Hunter Valley, tucked into a rustic barn featuring an al fresco, Tuscan-inspired courtyard and surrounded by sandstone buildings in the heart of the Hunter. Feast on Italian-inspired meals made from locally sourced and homemade produce, or sip on fine coffee next to the antique 18th century fireplace. Enzo's is open for breakfast, lunch, and dinner and it's not to be missed. Having already won best Australian Contemporary Restaurant in the Hunter Region, it is no wonder The Cellar Restaurant, with its award-winning wine list, is so popular with locals and visitors alike. It's a wintery haven with its large open fire and hearty, seasonal fare ranging from entrées of crispy line-caught calamari, orange, and fennel, to its Berkshire pork chop and crackling, or whole market fish with lemon. Whatever your flavor, it's going to be good. And don't even get me started on the desserts. Raspberry and white chocolate parfait with boozy cherries, anyone? Situated in the Broke Fordwich area of the Hunter, Margan and its surrounding winery have won so many awards we can't even keep count. The interior is a cool combination of stone and metal with walls featuring stacked oak wine barrels, while the luscious, stone and native gardens overlook the rolling hills. The food incorporates the finest and freshest produce, topped off with an impressive array of accompanying Margan wines. If cooking is your thing, or it's just too cold to venture outside, the restaurant offers cooking classes guaranteed to help you release your inner Masterchef. This 5-star luxury guest house is nestled among the estate's private vineyard and includes luxury spa suites that boast their own fireplaces, lounge areas, and king-size beds, and come with a complimentary bottle of bubbles, wine, or beer and a cheese platter—now we're talking! Spicers' onsite restaurant, Botanica, is one of the most highly respected venues within the Hunter and is renowned for its sustainability pledge. The kitchen creates healthy, locally sourced, fresh and flavorsome dishes and the most delicious fresh bread, made daily onsite. While enjoying the good food and great wine, Spa Anise will leave you feeling pampered, rejuvenated and revitalised. Transport yourself to a Tuscan-inspired paradise! This 4-star boutique hotel is set on 26 acres of land, with views of 300 acres of vineyards and all framed by the magnificent backdrop of Brokenback Mountains. Tuscany will have you exploring the rolling landscape and surrounding vineyards, drinking and tasting regional inspired specialties and tapas at their eateries and bar, or relaxing with onsite massage therapy. Sign us up! Positioned in the heart of the Hunter Valley, the Hunter Valley Mercure is an award-winning boutique hotel surrounded by exquisitely landscaped gardens. The rooms reflect understated luxury with designer linen, sunken tubs, spa baths, and private terraces. The pool and courtyard are lovely and secluded, allowing for Al Fresco dining among the terracotta tiles and exotic hanging vines. Snuggle up next to the grandiose fireplaces with a glass of wine and a good book, or enjoy wine tours, pampering treatments, a game of tennis or even some shopping.